Up to 10 lbs. 21 lbs. - 50 lbs. Up to 10 lbs. 21 lbs. - 40 lbs. 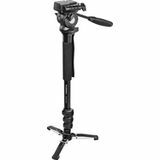 The Barska Monopod is a sturdy, lightweight aluminum camera support that helps you to capture clear, crisp images when you don't want carry a tripod around with you. 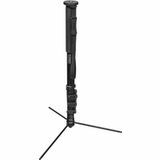 This versatile four-section monopod with a hidden fold-out tripod stand provides a delightfully portable, sturdy mounting for on-the-go use with spotting scopes, cameras, L-adapter equipped binoculars and more. Monopod only. Pan head sold separately. 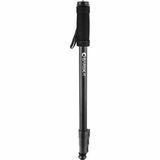 This versatile monopod features a fold-out mini tripod to provide both the versatility and the stability you need for on-the-go exploration with optical instruments like spotting scopes, cameras, and L-adapter equipped binoculars.